The concept of Ground Truth Trekking hearkens back to the expeditions of centuries past, when adventures were some of the first ways people learned about remote corners of the world. Our philosophy of adventure is not about record-setting, but is built instead on the belief that expeditions help us learn about our world. Erin and Hig, two of the founders of Ground Truth Trekking, began this idea with journeys to the proposed Pebble Mine, and from Seattle to the Aleutian Islands. In later years, the concept has expanded, bringing more adventurers, more places, and more issues - from climate change to gold mining, to the future of Alaska, and from southwest Alaska to southern Greenland. 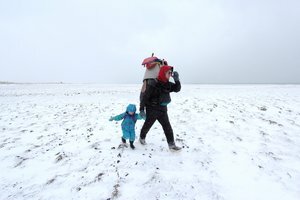 2015 - Bering Straits Spring: Erin, Hig, and the kids ski and walk and maybe paddle along the edge of the Seward Peninsula, around 500 miles, from March to June 2015. We'll set off on skis, tracing the edge of the Seward Peninsula. We'll follow the sea ice or the rolling hills, on snow machine trails or not. Our kids will follow along on their own tiny skis, or homemade kick sleds, or flop their tired little bodies onto our already-heavy loads. We'll burn driftwood in our collapsible titanum stove--if we can find driftwood. We'll travel eight miles in a day. Or we won't. We'll ski the whole way, or we'll strip the runners off the packrafts—walking and paddling as the land thaws beneath our feet. We'll visit half a dozen villages along the way: Teller, Brevig Mission, Wales, Shishmaref, Deering, and Candle. We'll be farther west than I've ever been, and in colder weather than our kids have ever been. We'll have an adventure. 2014 - Valleys of Coal: In Chickaloon coal debate, does what's best for locals even matter? Erin, Hig and the kids spend a couple weeks tromping through the Matanuska Valley coal fields in search of the Ground Truth. 2014 - Kachemak Packraft Traverse: Touring Kachemak Bay State Park with packrafts and children in tow. A 10-day journey with four young children in tow shows the beauty of Alaska's oldest state park. 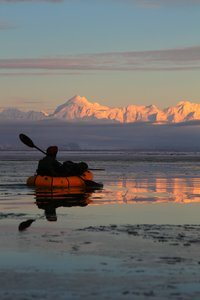 2013 - Tracing the Heart of Alaska: Erin, Hig, and the kids walk and packraft around Cook Inlet, 800 miles, from March to July 2013. This journey visits every community along the way, exploring Alaska's future through conversations with people that live there. 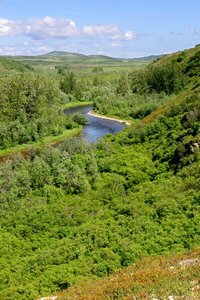 2013 - From Glaciers to the Sea: Following the Entirety of Alaska’s Susitna River: Chris Dunn travels 400 miles in order to document the Susitna River's entirety in the context of the proposed Susitna Dam. 2012 - Wild Revelations: Andrew Mattox walks from Lake Iliamna to the Revelation Mountains, then floating out to McGrath during June/July 2012. 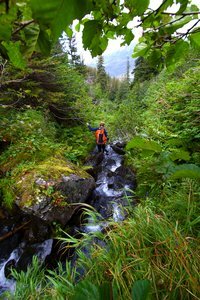 This journey looks at mining, geology, and one of the less-traveled parts of Alaska. This journey page is currently offline for updating. 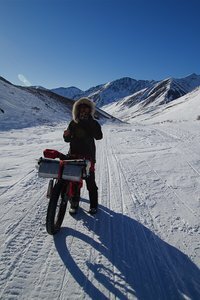 2012 - Unpeeling the Banana Coast: Josh Sturtevant and Brian Kennedy spend two months exploring natural resource issues in Greenland from June-August 2012. 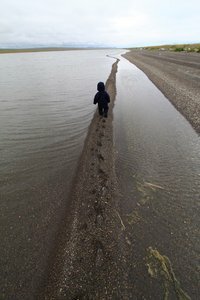 2009 - The Dead and the Dying: Erin and Hig explore climate change in their own neighborhood of Kachemak Bay, on a short journey through the diminishing glaciers of Tutka valley with their infant son and his grandmother. 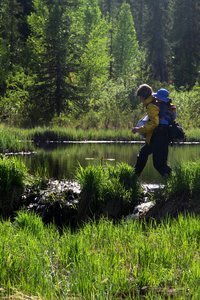 2009 - Lost Forests on the Lost Coast: Erin and Hig and their infant son head back to Cape Yakataga as a family of three, looking at remediation possibilities and the aftermath of logging on the Gulf of Alaska coast with Cascadia Wildlands. 2006 - Where Threatened Waters Flow: Erin and Hig and their friend Tom spend a month following the two watersheds downstream of the proposed Pebble Mine in a circle that stretches over 400 miles, from the mine site to Bristol Bay, and back alont the shores of Lake Iliamna, visiting villages along the way. 2005 - Journey to the Pebble Mine site: Erin spends a week alone, tramping around the site of the proposed Pebble Mine beneath roaring helicopters, glimpsing caribou through the fog, eating berries, and contemplating the footprint of a mine larger than Alaska has ever seen. 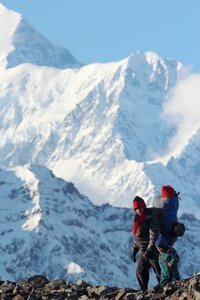 More Journeys: Read about over a dozen older trips on our old AK Trekking website. Read about the adventures here, learn more about the issues behind them, and see our photos and YouTube channel for more visuals. For those of you embarking on your own adventures, you may want to read about our gear and food choices here.